ARINC 419 Verification IP implements the digital transmision systems have been specified for inter-unit and inter-sytems communications on board transport aircraft. ARINC 419 Verification IP provides an smart way to verify the ARINC 419 standard data transmission and control interfaces between source and sink. The SmartDV's ARINC 419 Verification IP is fully compliant with ARINC REPORT 419 - 3 and provides the following features. Supports ARINC REPORT 419 - 3. Supports 32 bit words containing a 24 bit data portion containing the actual information, and an 8 bit label describing the data itself. Supports Transmission rates at 11 ± 3.5 kbps. Supports Bipolar Return-to-Zero encoding format. Status counters for various events. Callbacks in source and sink for various events. Built in functional coverage analysis. ARINC 419 Verification IP comes with complete test suite to verify each and every feature of ARINC REPORT 419 - 3. 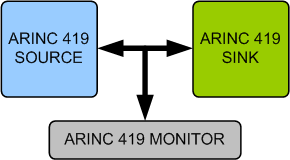 Faster testbench development and more complete verification of ARINC 419 designs. SmartDV's ARINC 419 Verification env contains following. Complete regression suite containing all the ARINC 419 testcases. Examples showing how to connect various components, and usage of Source,Sink and Monitor.